It’s finally happening! 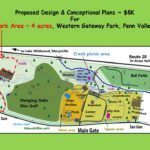 The Nevada County Planning Department approval has been received for the proposed Western Gateway Bike Park and now it is time to raise the funds needed to build this bike park. This is a community supported and community funded project that will be professionally designed and built. 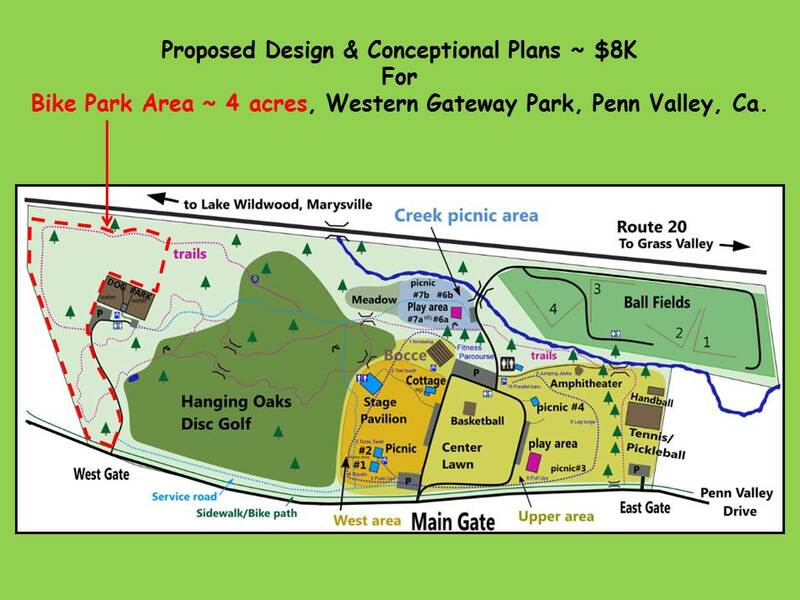 With the support of Western Gateway Park, businesses in our community, local non-profits, and YOU, we can make this idea come to life and with optimal build season approaching, the time is now. 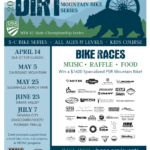 Help Support the Bike Park! More than 90 volunteers from multiple user groups (equestrian, bike, hike, motorcycle, +) worked together to complete a new trail linking Omega Road to the Pioneer Trail near Skillman Campground off of Hwy 20 east of Nevada City. Read The Union article. 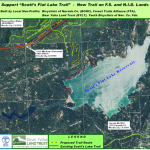 BONC-Grouse Fest – Project: Crooked Lakes Trail Re-Route. After camping at Lyndsey Lake, we 4x4d in to upper Rock Lake and hiked to start of pin flagged marked trail. This re-route takes trail to a beautiful vista point above Shotgun Lake. It was support of BONC’s effort to continue to improve the Grouse Ridge trail system. Check out the vid on the FS Facebook page. This USFS/NID trail project re-routed a user created trail with multi-user trail groups such as Bear Yuba Land Trust, Bicyclists of Nevada County, Forest Trails Alliance, and Youth Bicyclists of Nevada County Foundation. 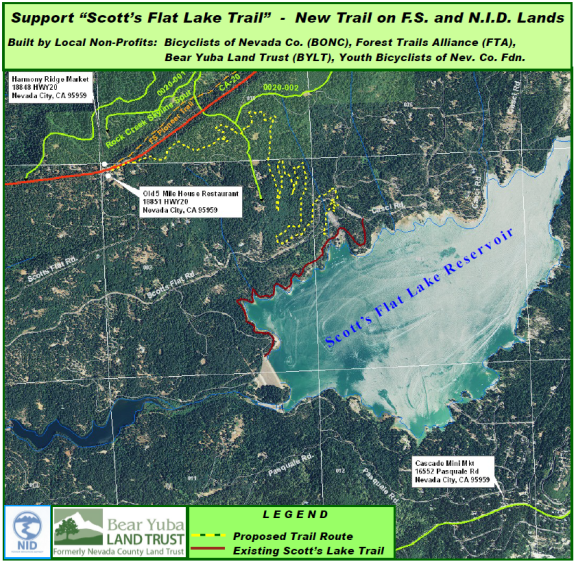 Trail will serve as a connector trail from NID’s Scott’s Flat Lake Campground to USFS Historical Pioneer Trail and vista points of Scott’s Flat Lake. Thank you to Specialized for awarding YBONC their $4k grant for the Scott’s Flat Trail Project! This USFS trail project has two re-route sections, adjacent to Grouse Lakes Area. Two designated spike camps for volunteers, one camp on north side of Upper Rock Lake, and the second camp on northeast side of Penner Lake. Base camp is scheduled at PG&E group campsite in Bear Valley, near Bowman Lake Rd. and CA-20. Once completed, this will make an awesome and improved trail loop for the Grouse Lakes area. The same multi-user trail groups from the Scott’s Flat Project will be involved. We are excited to have participated in a multi organization alliance to reroute the old Scotts Drop Trail from the Pioneer Trail to Scotts Flat Reservoir. It is a 4+ mile multi-use (human powered) trail. This was a successful trail work day with 54 adults and 41 youths volunteering. Re-route on Towle Mill Loop Trail, and trail maintenance on Hallelujah Trail. Furthest volunteer traveled 120 miles. YBONC won the 2011 Greenways Trail Award for our work on this system! 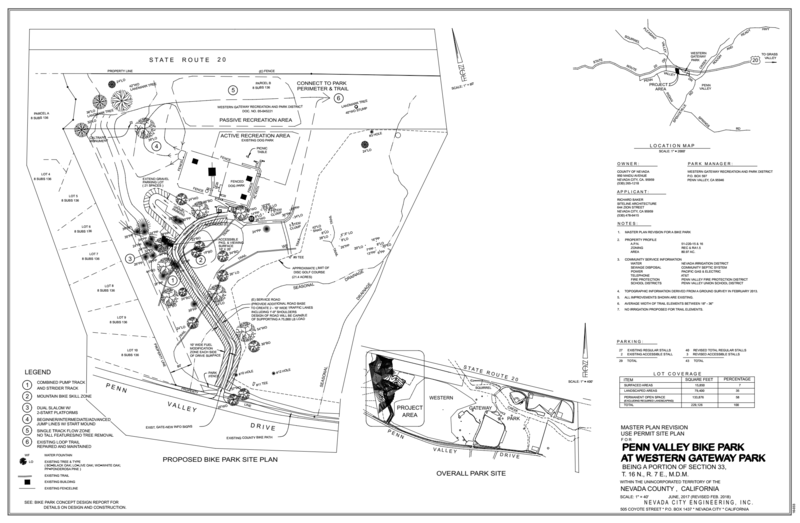 Loma Rica Ranch Trail Project was a complex project, involving City of Grass Valley, the private land owner, and multi-user groups. A big “Thank You” to Forest Trails Alliance for donating trail construction time and equipment for cutting trail base and design, Ascent Construction, the land managment for allowing use to implement trails in Loma Rica Ranch designated open areas of development plan, and for all the volunteers of our many local trail user groups. 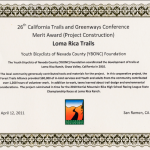 This was YBONC’s first Trail Stewardship Program project. 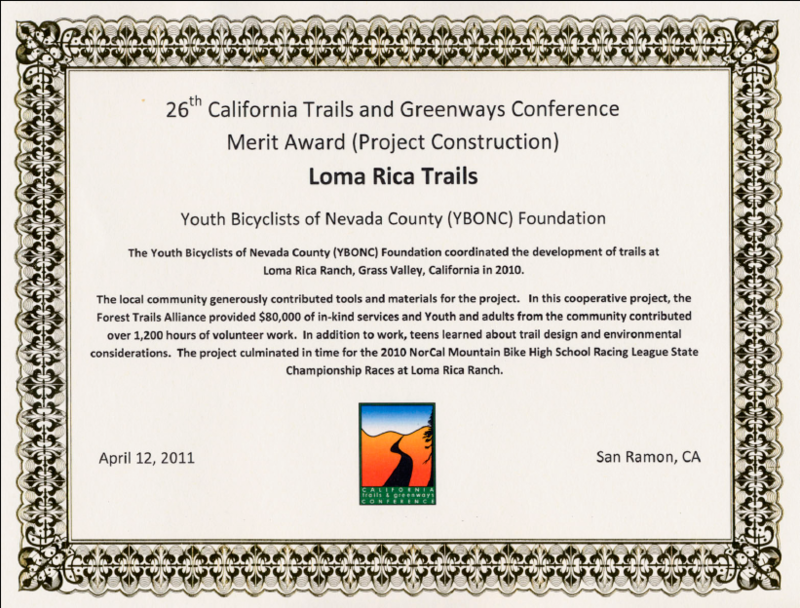 California Trails and Greenways Foundation presented 2010 merit awards to both FTA and YBONC organizations. It is on private land and only usable with permission.